An increasing number of people are taking whale watching cruises and flights. Whale watching (a term that includes all cetaceans – whales, dolphins and porpoises) and the tourism it brings, presents an economic opportunity for many communities around the world. Whilst the circumstances of these communities are often very diverse, the goal of sustainable whale watching, conducted in harmony with healthy cetacean populations in a healthy environment, is a shared one. The IWC is working with scientists, governments, NGOs and the whale watching industry, to assess threats, identify and share best practice, and support responsible, sustainable whale watching. The IWC Scientific Committee is studying the potential impact of repeated whale watching on individual whales, their populations and their habitats. This complex task requires examining both short- and long-term impacts. Factors to be considered include changes in behaviour and habitat use that may potentially affect feeding, reproductive success and even mortality rates. Particular attention has been paid to critically endangered and data deficient populations. This ongoing research has led the IWC to develop principles and guidelines for whalewatching which have helped guide the development of whale watching regulations around the world. Measures introduced include limits on vessel numbers, speeds, approach distances and time spent with whales, and a variety of training and permit schemes. Over fifty countries have produced national guidelines or regulations for whalewatching. Whilst issues can vary between species and locations, there are common strands of good practice which the IWC is drawing together to provide advice that can inform and complement national legislation. 103 different documents have been drawn together and analysed to establish best practice. In 2011, the IWC Whale Watching Working Group produced a Five Year Plan. The Commission agreed in 2016 that this should continue as the overarching strategy on whale watching which could be updated as required. The Group is also developing a Handbook for Whale Watching. This will be a web-based, living and evolving tool. It aims to support whale watching operators, regulators and managers, and those planning a whale watching trip, to educate and help ensure whale watching is sustainable now, and as it develops into the future. 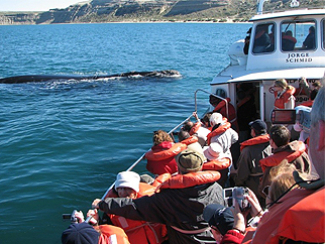 Whale watchers in Patagonia, Argentina. Photo courtesy of Fundacion Cethus. 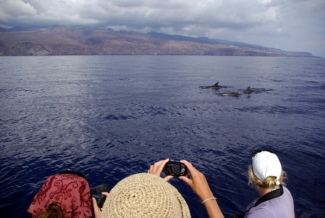 Whale watchers in the Canary Islands. Photo courtesy of Fabian Ritter/MEER.